Our friend’s colleague recommended us to Almond Bar. According to the recommendation, this restaurant was one of the finest Middle Eastern restaurants in town. When we got there, my first impression was: it’s a pretty restaurant with a lot of wooden decorations. Our maître d’ greeted us with warm welcome and showed us our table. The table was kinda small with pre-arranged menu and welcome snack. Upon glancing the menu, we found a banquet-type food that consisted of assortments of dishes from the Mezza (share dish). We decided not to take it and opted to choose from the list of food on the Mezza list. Since Maître d’ recommended us to get between 4-6 dishes, we expected to have a small-ish dish. We decided to have one starter and four Mezza on this occasion. 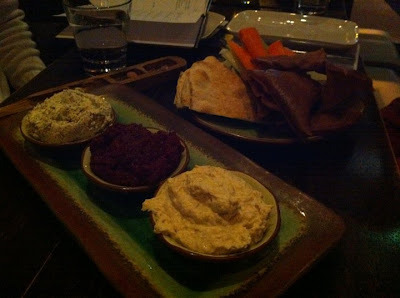 The starter was Pita Bread and Vegetables with 3 dips: Baba Ghanouj, Lab’tar, and Shawandarr. It came with deep-fried and baked pita bread. 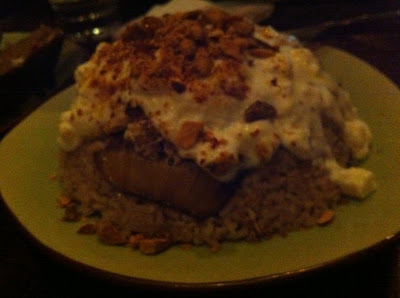 This was the nicest dish of the night, especially Baba Ghanouj, it accentuated on the eggplant’s smoke flavour. The mezza that was sort of in-between dishes were the Haloumi Cheese. It was pretty small and the cheese was pretty bland. 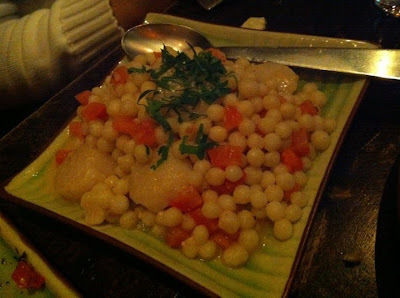 Next one on was the Scallops Moghrabieh. This time, the presentation was not good. Since the lighting was yellow-ish, there was no clear distinction between the scallops and cous cous. To top it off, the flavour was, again, pretty bland with a little bit of seafood sensation in the scallops. By this time, we kind of felt let down by the food so far. The Lamb Skewers only helped to increase our faith in the restaurant a little. 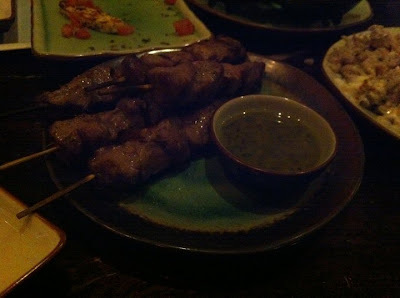 The lamb was nicely grilled and its sauce added an accent to its flavour. Last one on the line was Mukloubi with Chicken. It was written in the menu as the ‘Chef’s favourite dish growing up’. We had a very high expectation on this signature dish. When the dish arrived, we were taken aback by its shocking presentation. It looked like fried rice, covered in gooey yoghurt and a sprinkle of almonds. The taste was even more challenging, considering that we have never had fried rice combined with yoghurt. I personally think that those two don’t go well together. It could have been better if the yoghurt was served on a separate bowl as an optional add-on. The final verdict: It was a nice and quiet place to have dinner. The service was also good. The food was not particularly appealing and over-priced. 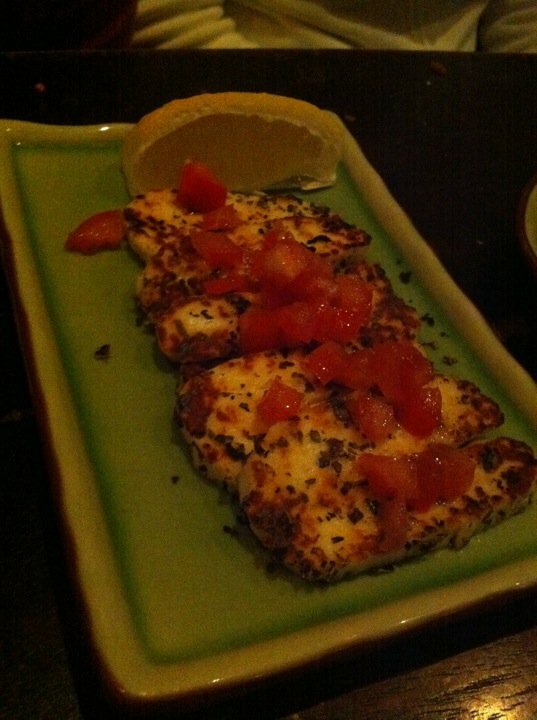 In terms of flavour, it was pretty standard and way off of our tastebuds.The only consolation they had was the dips. There are plenty nice-looking restaurants, but be careful not to choose some random ones without any recommendations or you might be disappointed!